Harry often does a go slow on walks. People make comments like "Poor old boy" . I tell them "He is only 12 - that is still young for a Border Terrier". "Looks like he is pretending so he can get his old age pension early then!!!" A little further on and I throw a stick. Instantly, Harry forgets the pretence about being a slow old boy, and runs about like a youngish 12 year old. Harry my Pips does that too and thank you now I know why! Huh pension! She's 14 so does that mean she is old? Not so old dog and up to all his tricks! 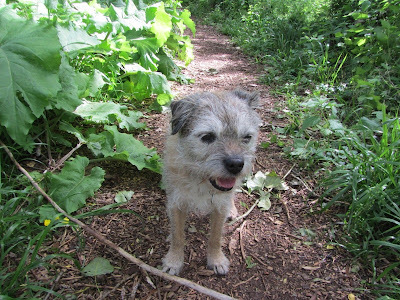 You is doin wot a terrier do naturally Arry: movin at optimum speed.